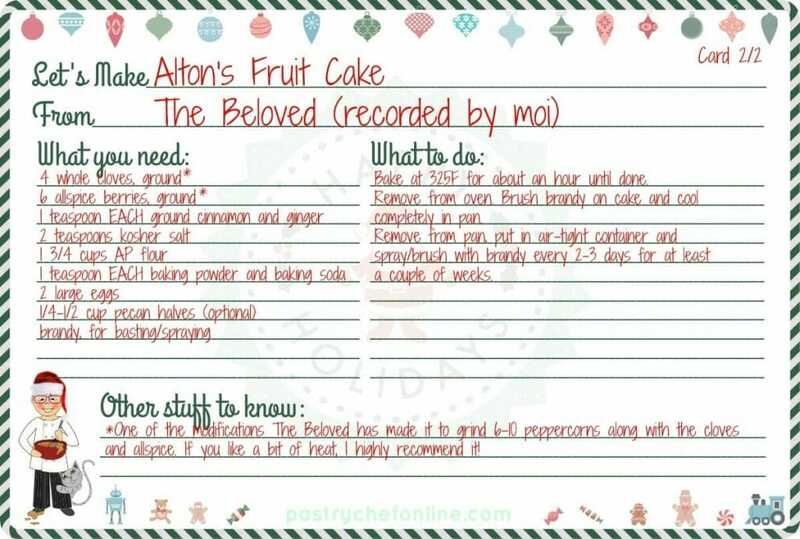 Every year, the Beloved makes fruit cake, specifically Alton Brown fruit cake for Christmas, and I’m going to show you how to make it. It’s so good. Honest! Alton Brown’s fruit cake recipe, free range fruit cake, is simply the best. My husband has made it for years and has tweaked it just a bit. You’ll love it! Six years ago, I wrote a post about how The Beloved started making Christmas fruit cake one year. Now, he has been making slight variations on the very same Christmas fruit cake for eleven years, and he makes dozens. He uses Alton Brown’s standard recipe for “Free Range Fruitcake,” but over the years, he has put a bit of his own spin on it by changing the spicing just a bit. This fruit cake is the best fruit cake recipe ever. I went from being an avowed fruitcake hater, or at least a fruitcake mocker, to looking forward to the start of fruitcake season. And, if I have been pleasant, I get to lick the pot after he scrapes the batter out into the pans. One of the great things about this moist fruit cake is that you don’t need a mixer to make it. You need a big old pot, a wooden spoon, your ingredients of course, and some pans to bake in. Although the ingredient list is long, the procedure is simple. Macerate a ton of dried–not candied and weird–fruits and citrus zest in golden rum for a few days. Plop all of that into a pot with some more liquid, sugar, and spices and simmer for awhile. Let the goo cool then stir in eggs, dry ingredients and then bake. No mixer needed, and the house smells amazing. Put the cakes in airtight containers and brush or spray them with brandy every couple of days for at least four-six weeks. I know there’s the joke about there being only one fruit cake in the entire world, and it just keeps getting passed around and around. But seriously, there are some really delicious fruit cakes out there, including this very recipe. You do have some options for gifting excellent fruit cakes, either premade already in a beautiful tin, or making a homemade fruit cake and packaging them up yourself. Here are some ideas for you. Yes you can. Instead of soaking the fruit overnight, you can plump the fruit in a pan with the same amount of apple cider. Since apple cider is sweeter than rum, you can probably cut back on the amount of sugar by a couple of tablespoons. For spraying the fruit cakes afterwards, you can spray them with apple cider–that Martinelli’s would be nice, actually. 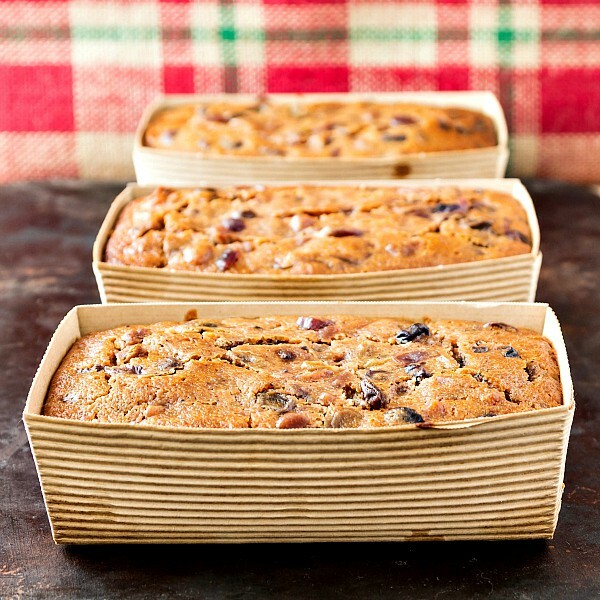 Unlike with the alcohol-laden loaves, you’ll have to refrigerate the non-alcoholic fruit cakes. I have a lot of Christmas-themed recipes on my site–cookies, cakes, etc–but I have a couple of favorites. First, my Auntie Ev’s Trifle, which is one of our family’s traditional Christmas desserts that her family brought with them from England. The other, also from Auntie Ev’s family, is her plum pudding. Moist and rich, doused in brandy, set afire, and then served with a healthy scoop of brandied hard sauce. 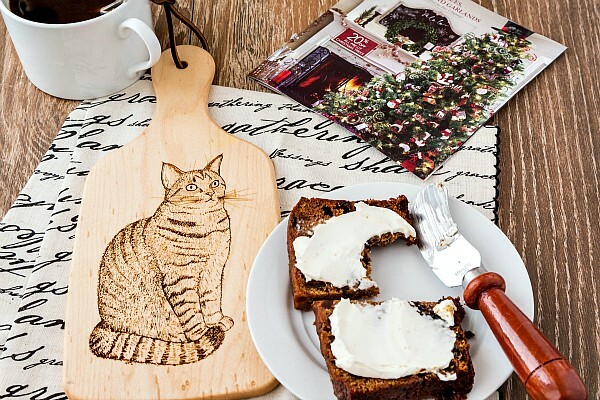 If you’re a fan of Christmas puddings, this one is a fantastic example. NOTE: You have to grind all the fruits up for this plum pudding. Auntie Ev’s recipe says to just mix everything together. And you can do that, but it won’t be the rich, dark color Christmas puddings are known for unless you pass all the fruit through a grinder. 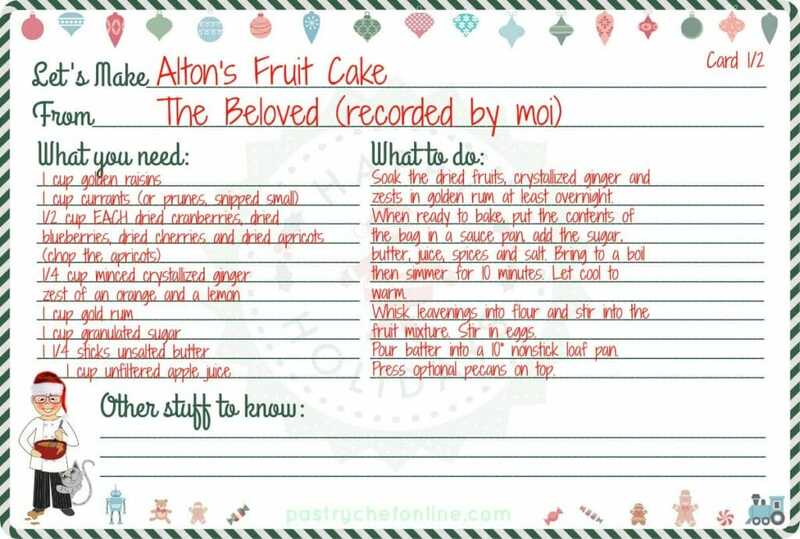 Yes, Auntie Ev had a wonderful fruitcake recipe too, but I like Alton’s better. The Beloved usually starts his Christmas fruitcake right after Labor Day, and by the first week of December, the corner of our closet is piled high with containers of aging fruitcake. In a good way. Not in a Grey Gardens sort of way. 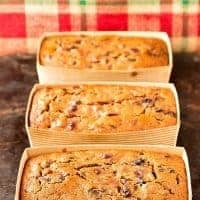 The Beloved's fruit cake is boozy with rum and brandy, spiced with all the Christmas spices and is positively brimming with intensely flavored dried fruit. This stuff will make you rethink your fruitcake skepticism. At least a day before, soak the raisins, the rest of the dried fruit, the crystallized ginger and the zests in golden rum. You can do this in a zip top bag if you want. Shake the bag occasionally. 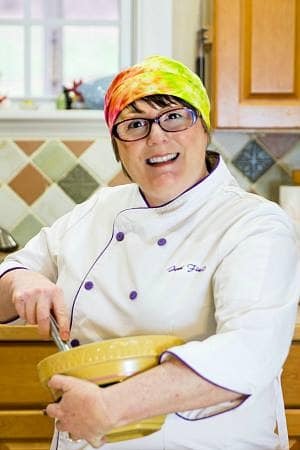 When you're ready to bake, preheat the oven to 325F and then dump the contents of the zip top bag, including any liquid, into a 3 1/2 quart sauce pan (or similar size. Don't go buy a new pan). Add the sugar, butter, juice, and spices (The Beloved grinds the cloves, allspice, pepper and salt together with a mortar and pestle. He wanted me to tell you that) and bring to a boil. Turn the heat down and simmer for 10 minutes. 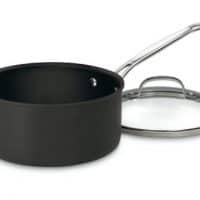 Remove the pan from the heat and let it cool for 30-45 minutes. Whisk the flour, baking soda and baking powder into the fruit mixture, combining it quickly with a wooden spoon. Stir in the eggs thoroughly, one at a time. Pour/scrape the batter into your prepared pan, smooth the top and press on the optional pecans (in a design or not). Bake until a toothpick inserted in the center comes out clean. You're looking for an internal temperature of 200F. This will take about an hour or a bit longer, so test at a hour and go from there. Remove cake from oven and liberally brush the top with brandy. Once the cake has cooled completely, turn it out of the pan and put it in an airtight container. Brush or spray it well with brandy every 2 or 3 days and let it age for at least 2 weeks or up to pretty much forever. Enjoy toasted and spread with cream cheese as we do. So delicious! This recipe makes 1 10" loaf of fruit cake. 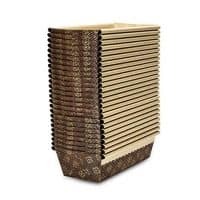 You can also divide it evenly among decorative, giftable paper pans as The Beloved does. The ones pictured here are about 6" x 2 1/2" or so. He has also made these as really min loaves and as muffins. It works no matter the shape or size of the pan, you just have to monitor them because smaller ones bake in less time. We always line the pans with parchment even if Alton didn't tell us to. Just for insurance. Nutritional Information calculated on 1/10 the entire recipe. 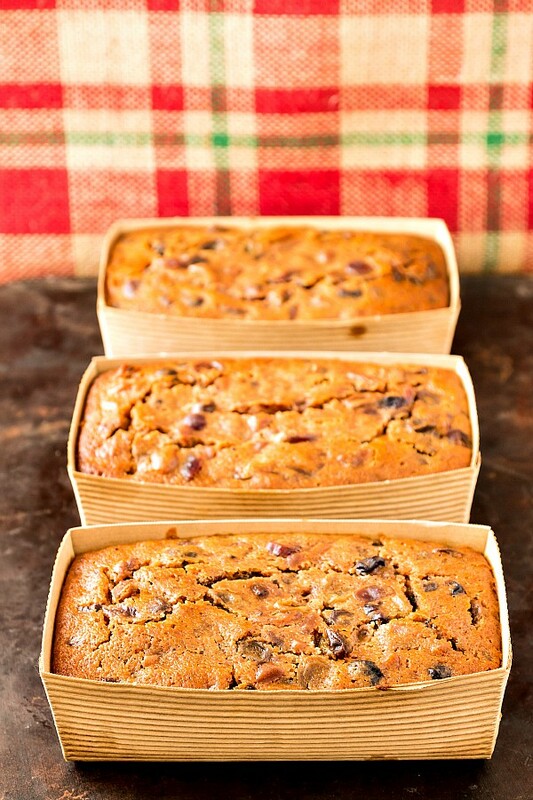 Try this fruit cake toasted and spread with cream cheese. Lord, it's amazing! How to serve fruit cake? Might I suggest toasting it and slathering it with cream cheese? 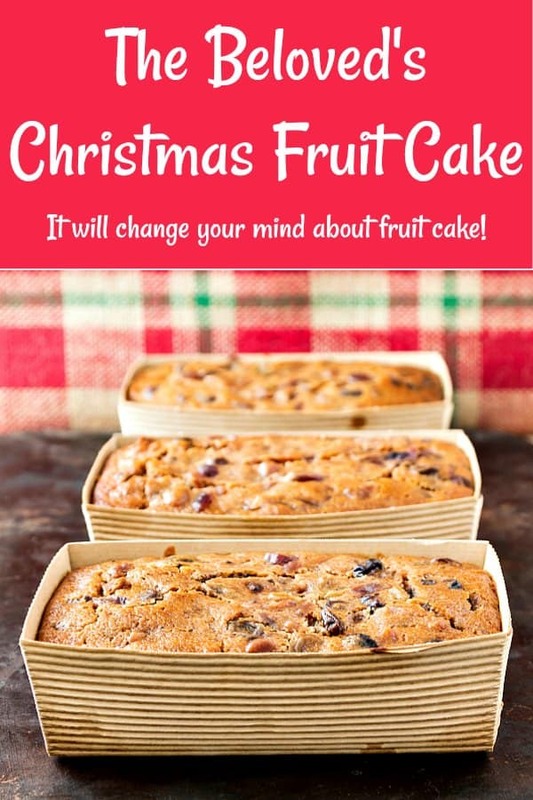 And here are the printable recipe cards for the fruit cake recipe. The .pdf has both on one page, and both are linked to it. Click either picture to open and save the recipe, or you can right-click each picture and save them that way if you prefer. 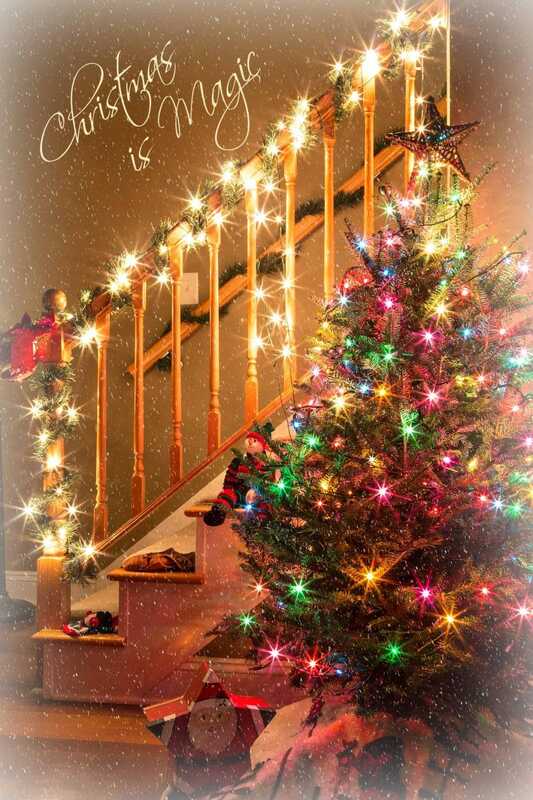 Get all my free Christmas recipe cards if you like! Does the alcohol you use matter? I have a bottle of very good cognac that was gifted to us, so I was wondering if I could use that instead of brandy. You can certainly use the congnac, but I’m not sure I’d use an expensive bottle just to spray down my fruit cake. Totally your call and if you’re not going to drink it otherwise, you may as well go for it! I used fancy cognac once and it didn’t task as good as the ones made with cheap brandy. I also tried bourbon (didn’t go well). What can use instead of alcohol? We have made non-alcoholic versions before, and we used extra apple cider in place of the rum and also for spraying after baking. In that case, you have to store the fruit cakes in the fridge. Just bring slices to room temp (or toast them–so good) for serving. Enjoy! Can the fruit cake, completed, but frozen? Hi, Robert. 🙂 You can freeze it, but it really isn’t necessary if you are brushing it or spraying it with brandy every few days. It will continue to get deeper and richer in flavor. We just store ours at cool room temperature and then keep them wrapped and in the fridge once we cut them. Thanks so much! I loved the fruitcake. I made it this Christmas and it was everything you said it would be. Our local liquor store had a Christmas blend of rum and brandy together so I used that. 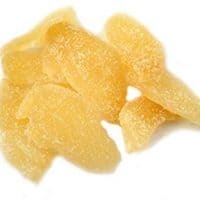 Very tender and I loved this particular blend of fruits instead of the regular candied ones.